The Illinois High School Association (IHSA) Chess State Series will forge new ground on Saturday, January 27, when the Association conducts its first-ever Sectionals in the activity. The eight Sectionals will be hosted at Belleville (East), Chicago (De La Salle), Hinsdale (Central), Mahomet (M.-Seymour), Orland Park (Sandburg), Palatine (H.S. ), Plainfield (South) and Rockford (Guilford). 159 teams will play in the sectional round. 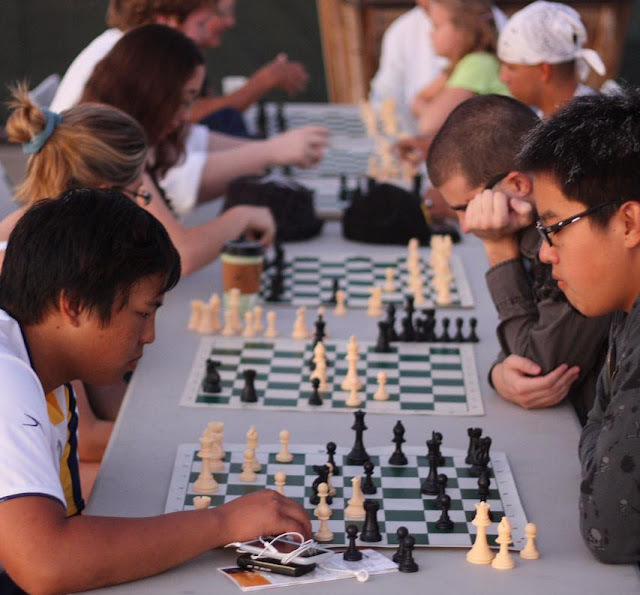 "Almost a quarter of IHSA member schools now have chess programs, and the number continues to grow," said IHSA Assistant Executive Director Scott Johnson. "All the credit goes to the coaches who give up their evenings and Saturdays to shape their players into a team. Eight of those coaches have taken on the added responsibility of hosting a sectional meet this weekend, and deserve a big round of applause." The Sectionals will serve as a qualifying round for the IHSA Chess State Finals, which will be held in the Peoria Civic Center ballroom on Friday and Saturday, February 9-10. The Civic Center has hosted the state finals since 2001. Chess debuted as an IHSA activity during the 1974-75 school year, thanks in large part to the efforts of Mike Zacate, and has grown into what is believed to be the largest team chess tournament in the country, if not the world. A chess team consists of eight players and up to four alternates. In a team competition, the Board 1 players square off in one game, the Board 2 players in another, and so on. A varying number of points are awarded for each individual match to determine the team result. Previously, any school that entered into the tournament competed at the state finals, which was the lone round of competition. Steady growth spurred the decision to expand to Sectional qualifying rounds, as a state-record 149 teams participated in last year’s tournament. 96 teams participated in the 2001 finals in Peoria. The 128 mark, which is considered optimum for the tournament, was surpassed in 2010. Approximately 1,550 competitors and 300 coaches attended last year’s state tournament. The number will be scaled back slightly with the qualifying rounds. Teams that win two (or more) matches in the four rounds of sectional competition will advance to state, and about a dozen at-large teams will also be chosen to round of the field of 128. Founded in 1900, the Illinois High School Association (IHSA) is a private, not-for-profit organization with more than 800 member high school schools in the Land of Lincoln. The IHSA’s mission is governing the equitable participation of over 400,000 high school students competing in nearly 40 sports and activities. Headquartered in Bloomington, the IHSA strives to promote academics, sportsmanship, safety, good citizenship and the lifelong values that are the foundation of interscholastic participation. Visit www.IHSA.org for more information or connect with the IHSA on Social Media via Facebook (/IHSA.IL), Twitter (@IHSA_IL & @IHSAState), Instagram (/IHSA_IL) and YouTube (/IHSA). The Future Plays Here!